Thanks for your interest to host an event at HuntsvilleWest! Our space has been designed to facilitate serendipitous collisions. 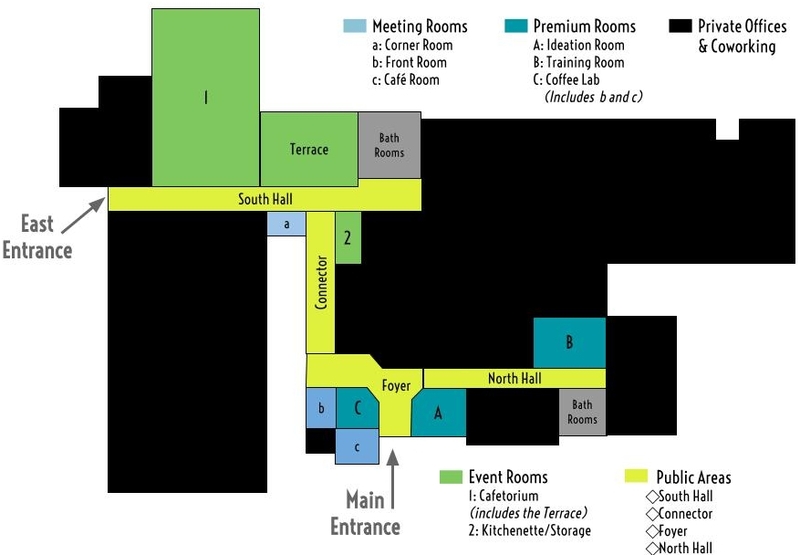 Therefore, while your event is going on there might be people walking by or meeting in nearby spaces and offices. We cannot guarantee privacy in our shared spaces such as the Library, Hallways, or Cafetorium. If you need privacy, we strongly encourage you to book our meeting rooms. The primary purpose of HuntsvilleWest is to serve and support its coworking members and their guests. Therefore, we give priority to member-led or sponsored events. Event organizers should comply with our Code of Conduct and follow our established protocols for events including our Events Checklist. Events happening at HuntsvilleWest shall support our mission and promote our values. If the event has a cost what is the ticket value? If so, who will be serving the food/alcohol? If serving alcohol, advertising must focus on the event, not the alcohol. Phrases such as "Beer Bash", "All You Can Drink." will prompt additional review by our staff. Event Hosts are responsible for applicable state and local laws governing events and alcohol. If you have created an event in Facebook, make sure to make HuntsvilleWest a cohost and to include HuntsvilleWest as the event location.